Leah McHenry is one of the few solo artists of the symphonic and Celtic metal world, and she is known for being on the more soothing side of this genre's spectrum. I was swept away by the ballads on her little album Otherworld, and was thus excited for Kings and Queens, the next chapter of her discography. The first track, "Arcadia," undoubtedly stands out as one of the best of the album. A male-dominated choir echoes in the beginning before catchy and intense guitar riffs blend with the choral vocals. This is definitely heavier than the material on Otherworld, but Leah's voice sticks to its softer quality and this general change prevails on most of the album. The intro, post-chorus, and middle eight are show-stoppers in their own right, with the intro and post-chorus being quite heavy and the middle eight being very epic and flowy as Leah's light voice soars: "A shining golden citadel, upon a hill / No empire shall overcome / Dreams never to be forgotten." Kings and Queens gets even heavier (and darker) yet with "Save the World," and it's easy to hear the Eastern influences in this song, sort of like in Epica's music. There's a good chunk of double bass after the chorus (and I'm a sucker for some intense double bass) as Leah vocalizes a bit in the background - it's basically a moment of symphonic metal perfection. The chaotic beginning of "Palace of Dreams" has a similar atmosphere, but unfortunately I can't love the rest of the song as much, until it abruptly ends in the same style it began... But that transition probably could have been much better. 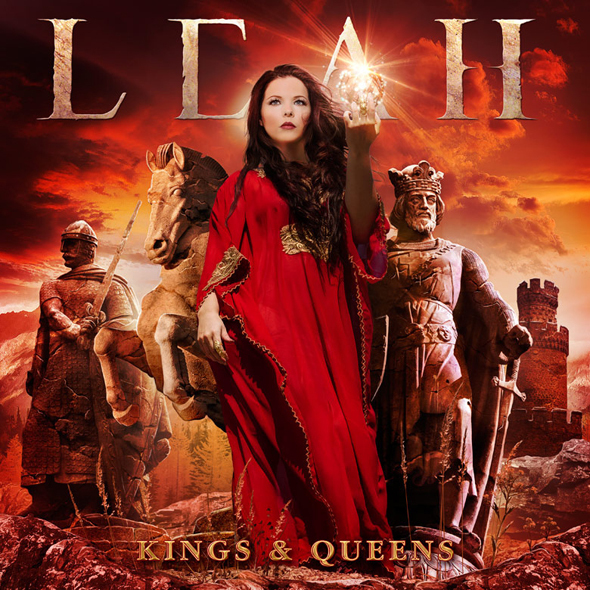 Since Otherworld was such a mellow album I guess I didn't expect so many great guitar riffs from Leah, but there ended up being plenty of examples on Kings and Queens amid some of the more delicate sounds she mastered on Otherworld. Her first single, "Enter the Highlands," includes some of the heaviest riffs, and they aren't instantaneously catchy, but I mean that in a good way. I mean that in a "Requiem for the Indifferent" sort of way: It's kind of complicated and took a while to grow on me. Leah's going beyond the basic form. Yet, at some point, her vocal lines from this song kept getting stuck in my head; I especially struggle to get the multi-layered chanting out of my head: "Souls... souls... souls..." Leah's voice is also layered like a choir in "Remnant" and weaves with the guitars most memorably, and this one is also no stranger to great riffs amid synths. Even though Kings and Queens takes on a heavier approach compared to Otherworld, Leah still makes room for softer moments. "Hourglass" and the acoustic version of the English-Irish ballad "Siúil a Rún" are rather beautiful, with "Siúil a Rún" being one of my favorites. As mentioned before, Leah loves her world influences, and I love how she weaves them into her music - especially this song. Kings and Queens features both an acoustic version of "Siúil a Rún" and a rock version, of which I prefer the acoustic version. Leah experiments with different cultural sounds most notably in "In the Palm of Your Hand" and "The Crown," but neither of those really stood out to me. But the thing with Kings and Queens is that it's honestly taken FOREVER to grow on me. It seems that in every song I don't particularly like right away, I fall in love with one or two sections and before I know it I'm jamming to the entire track from start to finish. In fact, it's happened with almost all of the songs I've mentioned so far, save "Arcadia." Currently this seems to be happening with "Angel Fell" - that echoey harpsichord-type instrument is so haunting and that post-chorus is purely amazing; I bob my head every single time I hear it. So even though I may not love every single track at the moment, who knows what I'll think of them by the end of the year. The point is that Leah McHenry has created an altogether impressive symphonic metal album. It isn't quite perfect, but any patient listener who appreciates musical complexity will find that there are some killer tracks on Kings and Queens. It surprises me how incredibly underrated she still is within this community - it's not like the fanbase of this subgenere is a stranger to underground music. (Plus, members of Delain worked on this album, so that should at least make their growing fanbase curious.) But once people stumble upon Kings and Queens, I'm sure they'll understand the appeal. Leah's got skills.